These English grammar worksheets provide a variety of practice exercises with verb tenses, sentence structures, parts of speech, and common errors. For explanations of the grammar involved, see also English Grammar Lessons and English Verb Tenses. For similar practice online, see Grammar Practice. The individual English grammar worksheets on this page are all free, as is the Revision and Proofreading Checklist. 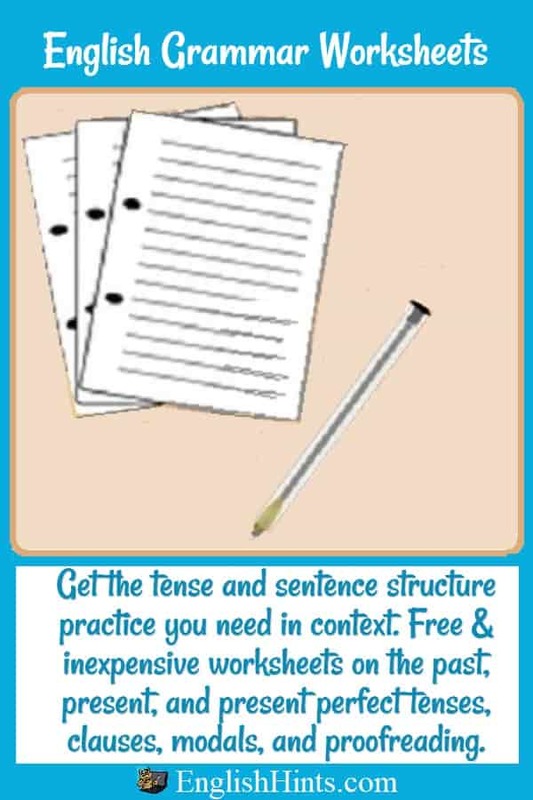 The past tense packet offers many more worksheets as well as game suggestions and materials. 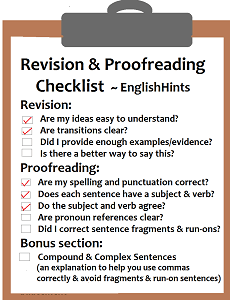 This is a three-page checklist asking students to review and revise their writing for clarity and completeness, then proofread for spelling, capitalization, punctuation, and grammar errors. The third (optional) page explains compound and complex sentences, to help students recognize and eliminate sentence fragments, run-ons, and some common errors with commas. It's written for Intermediate up English language learners from grade 6 to adult. 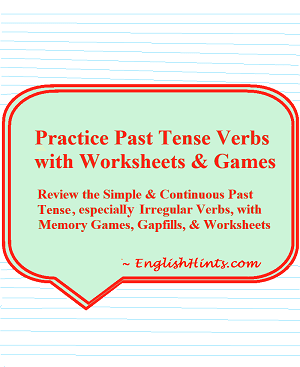 See also Games to Practice the Past Tense in Printable ESL Classroom Games. It includes many more memory games, as well as the two in the packet below, and also some sentence scrambles and other ways to play with irregular past tense verbs in English. This 18-page packet (plus answer keys, memory game back options, and bingo template- 30 pages total) offers students multiple ways to practice the past tense of regular and the most common irregular verbs. The packet includes worksheets and game ideas to learn and practice regular and irregular verbs in the simple and continuous past tenses. Over 50 of the most common irregular past-tense verbs are practiced in sentences and again as gap-fills in longer text-- most of them at least three to four times. 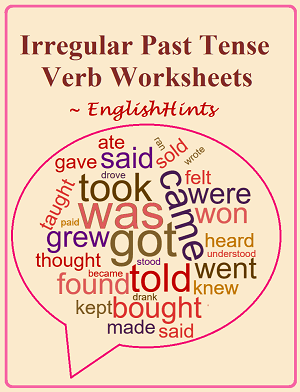 Download the Past Tense Verb Worksheets packet now for $7.00 by clicking the buttons below. 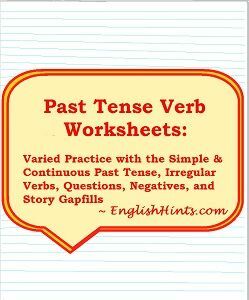 These worksheets can help you review and practice the past tense in English. The later ones build on skills practiced in the earlier ones. You can review regular past tense verbs, then practice each of the fifty or so most common irregular verbs in English on several different worksheets. The worksheets are mostly short, so you can practice 15 or 20 minutes at a time whenever you have a few minutes. This packet also includes instructions and 32 cards to make two memory games practicing 16 of the most important irregular verbs. The game can be played alone—trying to beat your previous speed-- or with friends. It’s an entertaining (almost addictive) way to review these most common irregular verbs. You can download this personal study packet on past tense verbs for $5.50 by clicking the button below. This is a shorter, less expensive individual-study worksheet packet. It's the Practice Past Tense Verbs Worksheets without the memory game cards or the full-page regular past review. You can download it for $4.00 by clicking the button below. Again, you can practice much of this (and more that I don’t yet have in pdfs) at Grammar Practice. If you're preparing for a big test like the IELTS or TOEFL and need to practice your writing, see English Essay Writing Practice. Home> ESL Worksheets> English Grammar Worksheets.